Is bigger better? 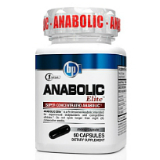 BPI Sports thinks so and has released Anabolic Elite to help you get bigger. Anabolic Elite promises to significantly enlarge your muscles, improve vascularity, and give you amazing energy. But can Anabolic Elite succeed where so many other testosterone supplements have failed? Gentiana lutea is a yellow flower that has been used for centuries to improve digestive and blood problems. It helps you build and heal muscles quicker by boosting oxygen-carrying red blood cells. Blepharis edulis has traditionally been used as an aphrodisiac. Modern studies show that it acts as a bronchodilator, increasing the amount of oxygen absorbed into the body. This means muscles will have a better supply of oxygen resulting in generally better athletic performance and endurance. Cestrus nocturnum is a fragrant potato plant. While it is found in a few testosterone boosters, its actual effect on humans is unclear. Ficus hispida is a fig that is good for the blood, heart, and for exercising. It lowers blood sugar and increases sugar availability in the muscles, ensuring the muscles have adequate energy during long exercise sessions. This ingredient also calms the heart, boosting stamina and endurance. Coffee arabica has caffeine which breaks down fat stores, resulting in better metabolism and faster weight loss. In addition, studies show caffeine improves athletic endurance and performance. Caffeine also boosts mental functions such as memory and concentration. Unfortunately, this formula is a mix of promising and puzzling ingredients. Some ingredients, like caffeine and gentiana lutea, have been shown to facilitate better athletic performance and muscle building. But some of the ingredients, such as cestrus nocturnum, don’t appear to have any purpose in Anabolic Elite. Anabolic Elite doesn’t list any possible side effects on its label. However, some of the ingredients do cause side effects. For example, gentiana lutea can cause headaches, hunger, nausea, and flatulence. Caffeine is another area of concern as it can cause side effects such as headaches, difficulty concentrating, higher blood pressure, and even heart palpitations. That being said, out of 58 user reviews, I wasn’t able to find one complaint about side effects. Take one (1) capsule three (3) times per day on workout days only. Must be taken on a full stomach. For best results, take four to eight (4-8) consecutive weeks. A four (4) week break between cycles is recommended. Regardless of concerns over untested ingredients, users appear to see results with Anabolic Elite. On BodyBuilding.com, Anabolic Elite currently enjoys a score of 8.9 out of 10 from 58 users. Here is a sample of Anabolic Elite user feedback. You should be able to buy Anabolic Elite wherever BPI Sports’ products are sold. For brick and mortar stores, GNC is your best bet. The best deal is currently from Amazon, as it has the lowest price, free shipping, and great customer service and return policy. It’s always a good sign when a company backs its products with a guarantee. BPI Sports does back up its products with a guarantee. However the guarantee is rather limited. Here are the requirements for you to receive a refund from BPI Sports. 1. The product has to be purchased directly from BPI Sports, not from a vendor. 2. The item has to be unopened and in its original packaging. 3. The item has to be received by BPI Sports within 30 days of purchase. 4. The original packaging slip is required for reimbursement. 5. There is a 15% re-stocking fee. Should You Try Testosterone Success? We are conflicted about Anabolic Success. On one hand, many of the ingredients are unproven and their effects on the human body have not been studied. On the other hand, according to an overwhelming amount of users, the product works and doesn’t cause side effects. Nevertheless, because there isn’t a solid guarantee to back Anabolic Elite, look for a more established testosterone booster. Give Anabolic Elite a pass at least until more is known about its ingredients.